In a scene that wouldn’t look out of place in a science fiction blockbuster, researchers have unveiled the world’s first walking, talking bionic man complete with circulatory system and a beating heart. Called Frank, short for Frankenstein, the six-foot robot is made up of artificial body parts donated by various research centres from around the world, has 200 processors and is covered in over a million sensors. 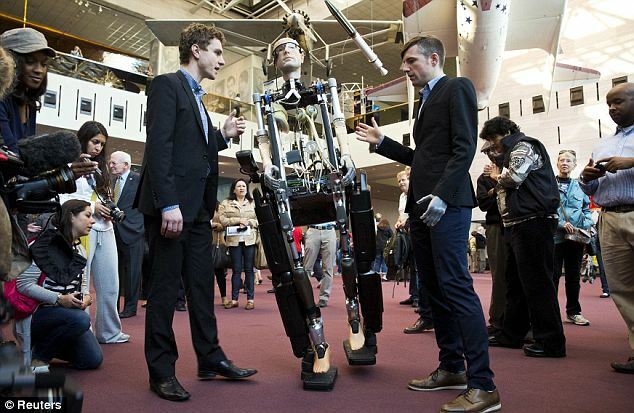 It was designed by Dr Bertolt Meyer from the University of Zurich, built by a team of engineers at Shadow Robot in London and is currently on display at the Smithsonian Museum in Washington as part of The Incredible Bionic Man exhibition. ‘The goal is not to replace the human being,’ Dr. Meyer told a press conference on Thursday. Dr. Meyer is a social psychologist and was the model for Frank because he has a bionic hand himself. A total of 200 processors fitted to Frank are powered through 70 circuit boards and 26 individual motors. 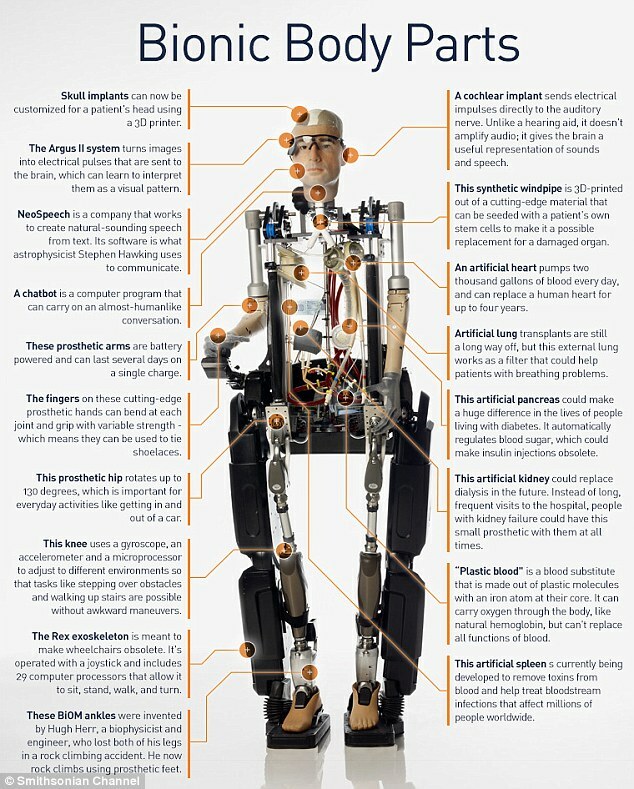 The London engineers built Frank using 28 of ‘the most advanced artificial body parts available today from laboratories and research centres around the world’ as well as implantable synthetic organs. Frank’s face was then made of silicone and is a replica of Dr Meyer’s. Engineers designed the Bionic Man to enable several of its ‘human’ parts to operate without a body. For example, although the robot is fitted with limbs, it doesn’t have a brain to make them work, instead it is controlled remotely through a computer connected by Bluetooth. Frank is capable of walking and can talk and answer questions with the help of this human controller, via a laptop. Dr Meyer is set to explain more about how Frank was built and what it is capable of during a one-hour documentary to be aired on the Smithsonian Channel on Sunday 20 October at 9pm PDT. The documentary is only available to viewers in the U.S.
Meyer’s did tell reporters: ‘A female bionic companion would be great. Frank’s name is taken from Mary Shelley’s novel Frankenstein. In the book, published originally in 1818, Victor Frankenstein creates a living ‘monster’ from human body parts. Frank is also reminiscent of the Terminator robot played by Arnold Schwarzenegger in the 1984 film of the same name and the Six Million Dollar Man, played by Lee Majors in the 1970s, who was a fictional astronaut with bionic limbs called Steve Austin. Other artificial body parts featured in the Bionic Man include a heart from SynCardia Systems in Tucson, Arizona, ankles and feet from BiOM in Bedford, Massachusetts; a lung from Haemair Ltd. in England; ears from Cochlear in Australia; a pancreas from De Montfort University in the UK; and a prototype kidney from the University of California, San Francisco.